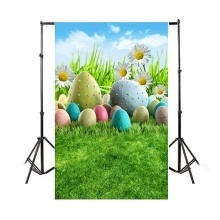 There are a series of Easter theme photography background provide for photo studio. Interesting and vivid patterns of grassland, rabbit, eggs, it is perfect for baby photography. It can fold, easy to carry. It can swab with water, easy to keep clean. Can be draped or hung straight easily. Also can be used for housing decoration. The bracket in the picture is not included.